I recently read the book Teaching with the Brain in Mind, by Eric Jensen, and it highlighted something that I need to do more deliberately in my classroom. In his explanation of the need for repetition in order to strengthen connections in the brain, he discusses the use of pre-exposure, previewing, priming, reviewing, and revision. Though I regularly do all of these when teaching, I am rather informal with the three that happen immediately preceding, alongside, or directly after the learning in the classroom; previewing, priming, and reviewing. Pre-exposure usually occurs days or weeks ahead of the actual learning. I introduce topics using collaborative Google docs, and more recently a Facebook group. Both of these platforms introduce material to students ahead of time allowing them to explore and discuss concepts and strategies before we dig in in the classroom. These are great formative assessment tools as the allow me to observe their discovery virtually, and it helps me to better structure my lessons. I am also able to jump in when there are misconceptions or the occasional exasperated student :-). 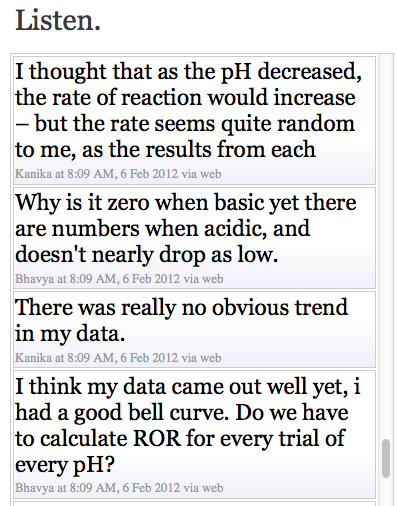 Yesterday, my students were having an engaging discussion about how to process data for their enzyme design labs. 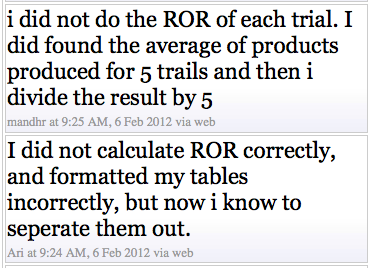 It was clear that repetition was going to be necessary, but as always, time is a factor. I decided to be more deliberate about using previewing, priming and reviewing during my lesson today. Enter TodaysMeet. TodaysMeet is essentially Twitter without all of the distractions. It is perfect for the classroom, because it allows students to ask questions, discuss what is being presented, and reflect on their learning alongside live presentations. TodaysMeet is simple to set up. If you click on the image below, it will take you to the site. No sign-up or e-mail address is required. All you do is: (1) Name your room. (2) Select the duration that you want the room data to be saved (this can be anywhere from 2 hours to 1 year). (3) Create class. That will take you to the chat space. Here you just enter your name and select join. Now you are ready to post! Anyone with the link can join the chat. Previewing is supposed to take place minutes or hours ahead of the learning. I used TodaysMeet as a tool to get kids to check-in and review the material that we were going to discuss in class. At the beginning of class I had them look over their lab draft, and post any key observations, questions, or difficulties that they had with the lab the previous night. This not only forced them to focus on the material, but it also gave me the information that I needed for some “just-in-time teaching”. I then asked for volunteers to project their lab and Excel spreadsheets so that we could reflect, question and provide feedback as a class. While the student volunteer explained their decisions, strategies and methods for processing, the student in class were instructed to use TodaysMeet to record their questions and observations without interrupting the student presenter. It is important to establish protocols for commenting so that the students are respectful to the presenters as you can’t edit comments. After the presenter finished, I discussed each aspect one section at a time and made suggestions. At the end of each section, I had the students review their own work and reflect using TodaysMeet. At the end of class I had the students post any remaining questions. I then read through the TodaysMeet transcript which is hyperlinked below the chat box and collated any remaining questions on a collaborative Google doc that was shared with the class. This will encourage students to continue their discussion allowing for the necessary revision to take place before the final draft is due in the next class. As my first class was leaving, I overheard a student telling a few students from the next period that class was great today…really helpful. So a big thumbs up for TodaysMeet.